The Paleozoic Era occurred from about 541 million years ago to about 252 million years ago. The meaning of the word Paleozoic derives from the Greek Word palaios – which means “ancient” and the Greek word zoe – which means “life.” Which is an apt name for this period in Earth history because this is when life really began to take root and become quite diverse. It was also a period of time in Earth’s history in which drastic climatic and geological change occurred. This era is broken down into six distinct periods: the Cambrian, the Ordovician, the Silurian, the Devonian, the Carboniferous and the Permian. The Cambrian Period began at the beginning of this era, about 541 million years ago and ended about 56 million years later or about 485 million years ago. This period of history saw a dramatic increase in the amount of life. So much so, in fact, that scientists have called this incredible increase in evolution the Cambrian Explosion. More creatures evolved during this time than during any other period of time on Earth – either before or after it. During this time, trilobites, algae and all forms of marine phyla evolved. This was also the period of time when the supercontinent Pannotia broke up. 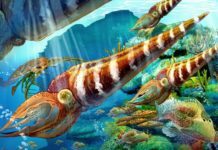 Beginning about 485 million years ago and ending about 443 million years ago, the Ordovician Period is a time in which many different kinds of organisms began forming the familiar biological classes that we are all used to today. During this time, cephalopods, coral, and primitive fish developed into their respective classes. As did snails and shellfish. There was also a surge of organism making it onto the coastal shores of the continent Gondwana. However, it was also a time for disaster. Glaciation caused a huge sea level drop and this, in turn, killed off the primitive arthropods that had developed on Gondwana. Eventually, this glaciation would spread all across the globe, leading to Snowball Earth. 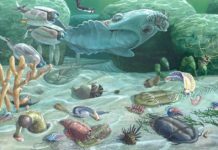 This would cause the Ordovician–Silurian Extinction Event – an event which killed off almost two-thirds of marine invertebrates and approximately a quarter of all families of each genus. Lasting approximately 24 million years, the Silurian Period ran from 443 million years ago to 419 million years ago. During this period, life began to rebound after the Ordovician–Silurian Extinction Event and Earth began to go from a cold, icy planet to a warmer one. Sea waters also began to rise after Snowball Earth began thawing. It was during this time that the first freshwater fish began to evolve, jaw-less fish increased their numbers and fish with jaws began to evolve. Vascular plants known as Cooksonia began to take hold on some of the four continents that existed during this time. These continents were Baltica, Gondwana, Laurentia and Avalonia. 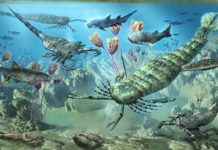 The fourth period of the Paleozoic Era is known as the Devonian Period. This period in Earth history ran for approximately 60 million years – from 419 to 359 million years ago. Many scientists begin to refer to this period as the “Age of Fish” because this is when fish relocated themselves to the highest pinnacle of the food chain. However, fish weren’t the only organisms to come to prominence during this time. No, this was also a time when the first amphibians began to evolve, as well as trees. Unfortunately, much of this progress was halted or destroyed by the end of this period. 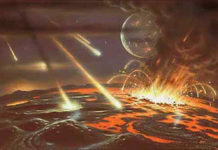 This is when the Late Devonian Extinction occurred – otherwise known as the Second Mass Extinction. The fifth period of the Paleozoic Era is the Carboniferous Period. This period lasted from 359 to 299 million years ago – or about 60 million years. During this time, global temperatures increases to about 20 degrees Celsius (68 degrees Fahrenheit) and most of the land was taken over by huge tropical swamps made from Club Mosses, Horse Tails, Ferns, and Cordaitales. When these plants died, they fell onto the water-soaked ground and formed great veins of peat. These peat veins would eventually turn into coal because the bacteria and fungi that would normally digest thick plant material hadn’t evolved yet. Beginning about 299 million years ago and ending approximately 252 million years ago, the Permian Period was quite a span of 48 million years. During this time, all of the continents had formed the supercontinent Pangaea. This enormous land mass was extremely dry because it had very little water in its interior, but its coasts were wetter because they were surrounded by a massive ocean called Panthalassa. On Pangaea, the first conifers began to evolve and animals such as Edaphosaurus took well to it. 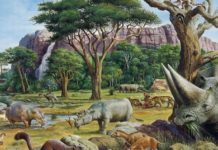 However, this progress was short-lived because of the Third Mass Extinction known as The Great Dying. A cataclysmic event which killed all but 5% of the world’s life. Starting shortly after the breakup of the supercontinent Pannotia, continuing on through the Cambrian Explosion, traveling on through multiple glaciations and three mass extinctions, as well as the rise of all new species, it’s pretty easy to say that the Paleozoic Era was both an exciting time and also a tragic one. Species rose and fell, continents formed and broke apart and the weather changed dramatically. By the end of the era, the Earth had begun to cool again, all the continents of the world came together to form Pangaea and the world was once again ready to head into a new era. 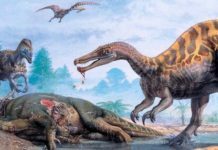 One that is called by paleontologists “The Age of the Reptiles” and by paleobotanists “The Age of the Conifer.” However, we probably know it best as the Mesozoic Era. This is the era that would follow the catastrophe, the splendor and the great change that came out of the The Paleozoic Era.